This appeared to be the battle between the competitors for Mercedes favor; all six of the German company's engine customer cars making it through to Q3 and only Raikkonen's Ferrari was able to enter the family squabble for the best grid places. If Mercedes are genuinely looking for a team to make their own, they are spoiled for choice on this evidence. The Brawn drivers gained some relief from their recent lack of form, most importantly taking grid spots well ahead of their closest competitors in the championship, the Red Bull boys. Whether their problem has been tires or aerodynamics, the team seems to have solved the BGP 001's dislike of fast corners and the championship begins to look an in-house affair between Button and Barrichello. Once again Rubens was quicker than Jenson, continuing his form of late, but matters were not quite as clear cut as they have been in the last three races. The two swapped faster times throughout practice and qualifying and there was little more than a hundredth of a second between their final qualifying laps. Red Bull must be wondering where their car's alleged speed disappeared to, Vettel and Webber ending up in ninth and tenth spots. In all probability, they are heavier on fuel than the other Q3 runners but even this indicates that the team knew there was no chance of a front row position for their drivers. Talking of fuel, it is easy to assume that Hamilton and Sutil are pretty light but that does not have to be the case. The Force India was very quick at Spa without running ultra-light and Hamilton looked as if he had speed in hand throughout qualifying here. The McLaren is clearly excellent on this circuit and Kovalainen was able to confirm this with a solid fourth spot to back up his team mate's pole position. Sutil looked a little more ragged than Hamilton on his quickest laps but the Force India is as good as we expected after its performance at Spa. One would think that the team stand a good chance of a first victory tomorrow, especially as Liuzzi returned to racing with a sound performance and seventh spot, but Adrian is surrounded by KERS cars for the start. With the long run to the first chicane, the likelihood is that the Force India will lose a few places in that mad dash from the grid and he will find it difficult to re-pass any KERS cars that get past. Best bet for first into the chicane has to be Hamilton or Raikkonen, therefore, and it is likely that Alonso, eighth in the KERS-equipped Renault, will also be coming through to give the Brawns some competition. Such speed differentials could result in a big traffic jam into the chicane and it would not surprise me if there are several drivers' races ended right there. Remembering Button's summary exit in Spa, the Brawn boys need to be pretty circumspect on the first lap therefore - points are all that matter for them now and a lost place or two will make little difference in the run up to the championship. The Toyotas faded away through the weekend after a good start in practice and BMW had a disastrous Q2 with engine failures for both Heidfeld and Kubica. Until then, they had been looking good for spots in the first three rows and it was cruel luck for the team to hit reliability problems at this stage in the game. Both the Williams and Toro Rosso cars were slow at this circuit and they ended up on the back rows of the grid, as expected. Now we have the wait until the fuel loadings are published but I suspect that, as at Spa, there will be no great surprises amongst them. The first seven or eight are likely running a bit light but very similar fuel loads and the Red Bulls, as mentioned, probably heavy. I hope that is true, anyway, as it would ensure that pit strategy will have no great part to play in the race tomorrow. This is one circuit where passing is possible and it should be driving skill coupled with quality of the car that produces the winner. Thats more like it, let the Cars do the talking!. 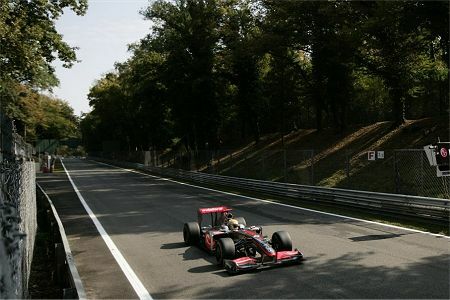 Fisi must be gutted, too abandon a winning Car for a 18 button Nightmare (no wonder Kimi`s always pissed) Ferrari. But thats the way the cookie crumbles, Be careful off what you wish for...cause you never know.....Oh the race, LH gonna romp it. Gusto: Agreed, it looks like being an easy Hamilton victory. There's a rumor that Liuzzi's odds shortened dramatically in the last couple of days and maybe someone knows something we don't - but I'll believe it when I see it. As for Fisichella, I can understand his need to drive for Ferrari but I'd have stuck with Force India if I'd been in his shoes. Keep seeing Liuzzi at 50/1, but Kimi at 9/2 worth a punt. "I hope that is true, anyway, as it would ensure that pit strategy will have no great part to play in the race tomorrow. " Sadly, this looks unlikely given the weights. Roll on refueling ban. Makes me fear for the quality of tomorrows race. Mr Soap: Yeah, I was quite surprised at how light the front runners are and how the others took heavier loads, almost as if they were not interested in going for pole. As it is, the danger man appears to be Kovalainen who can go for several more laps than those ahead of him. Somehow I cannot really believe in a win for Heikki here, however. More likely is Hamilton establishing a good lead before he has to stop and then rising to the front again as others head for the pits.